This book was fun, pure and simple. It was light reading for me, and the perfect break between heavier books. 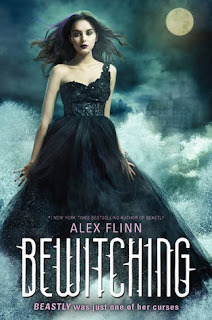 I've read Alex Flinn before (read my reviews of Beastly and A Kiss in Time) so I was expecting Bewitching to be a sort of "fluffy" read. However, I thought Bewitching had more substance than the other two novels of Flinn's that I've read. I liked Kendra's voice and especially liked that the story was told in parts. I liked reading about Kendra's history, and then her other (mostly failed) experiences with witchcraft. Kendra's story is broken up into parts, and she interjects her own history in between sections of the main story about Emma and Lisette. I thought that kind of writing style fit this book well, and it made things more interesting for me. I thought I knew where the story was going, but Flinn surprised me with the ending, which made things even better for me. I love it when authors surprise me! I really enjoyed this book and look forward to reading more from Alex Flinn. Her modern-day adaptations of fairy tales are a lot of fun to read. I want to read this for two reasons 1) loved Beastly and 2) her name is Kendra... is this one my taste?